Beer is the most popular alcoholic drink all over the world. Ale is another alcoholic drink very common in places such as the United Kingdom, Belgium, Ireland, and Germany etc. Most of you must be familiar with the term beer but what is ale? This article aims at making you more familiar with the two terms and the differences between them. Beer enjoys the status of being world’s oldest alcoholic beverage and also happens to be the third most consumed drink all over the world. 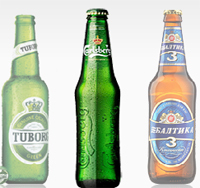 Beer can be further sub-divided into different categories. The two main sub-categories are lager and ale. The difference between a conventional beer (lager) and ale lies in the way the two are prepared. Beer is produced from the fermentation and brewing of starch derived mainly from cereal grains such as malted barley mixed with water and yeast to cause fermentation. Commonly hops are also added to the beer. They do two things. Firstly, they add bitterness to the taste and secondly, they function as a natural preservative. Fruits and natural herbs are also added sometimes to act as additional flavourings. Ale and lagers both make use of fermentation vessels for their preparation. In case of ale the yeast is fermented at the top of the fermentation vessel, this process takes place at a considerably high temperature. Ales tend to be aromatic. Some popular ale types are IPA’s, Hefeweizens, scotch ales etc. In case of a lager the yeast is fermented at the bottom of the fermentation vessel, this process tends to take place at lower temperatures as compared to the process involved in making ale. Very often they require being stored in cool areas for certain amount of time so as to let the process of fermentation complete itself before it is consumed. Some beers that are immensely popular all around the world include Heineken, Coors, and Guinness etc. lanceaksh. "Difference Between Ale and Beer." DifferenceBetween.net. September 18, 2009 < http://www.differencebetween.net/object/difference-between-ale-and-beer/ >. Mead is the oldest alcoholic drink you git.